rove is an CQI and IRCA Approved Training Partner, delivering accredited quality management qualifications and courses since 2010. For eight years, it has supported quality management professionals to develop and progress in their careers, through undertaking its quality management courses and qualifications. 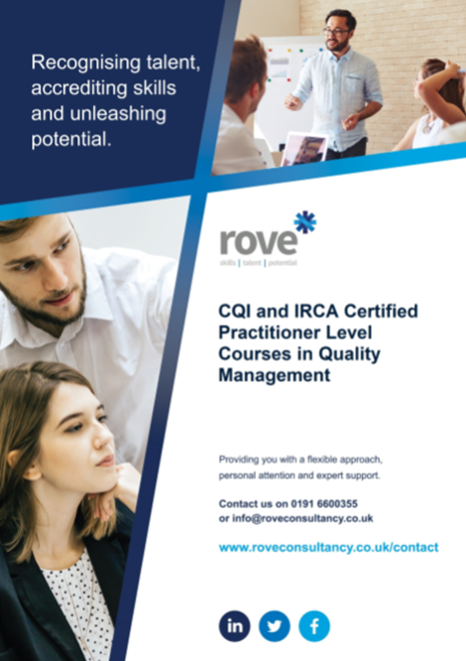 Following the introduction of the new CQI and IRCA Foundation, Practitioner and Professional accredited courses in 2016, rove has worked with over 100 learners, delivering over 150 courses from both the UK and Internationally. Why CQI and IRCA certified courses? You can achieve a professionally recognised CQI certificate. 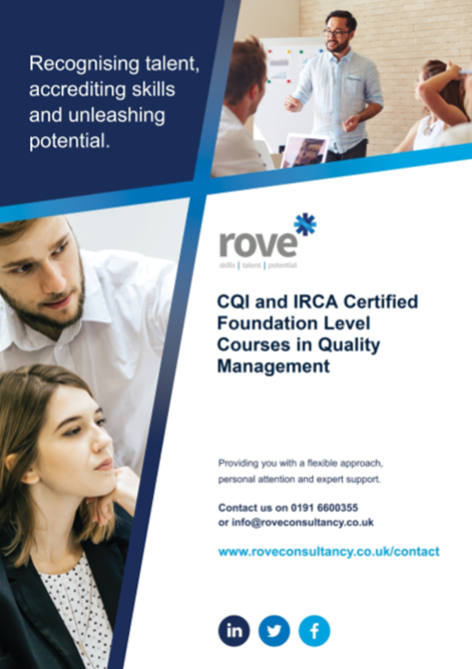 rove is the only accredited training provider to offer the full portfolio of quality management courses, so can support you at every step of your career. What’s more, if you are unsure which course is best suited to your skills and experience, rove’s experienced team will provide you with the right information, advice and guidance to ensure your investment in training delivers the best results for you. Professional – for those who want to achieve success at strategic level. Click on the information brochures, below, to find out more about our courses. These contain course overviews, content covered, duration, delivery and assessment requirements. By offering a range of training on quality management at different levels, these three levels of courses better reflects the integrated nature of the modern quality and auditing professions. Our courses are mapped against the CQI’s Competency Framework for the quality profession, so your learning is aligned with the skills and knowledge we know quality professionals need. You can personalise your learning to suit your career, area of expertise or development objectives. Read more about the CQI Competency Framework by clicking here and downloading the pdf. CQI and IRCA Certified Training courses are independently assessed by the CQI and IRCA, the leading professional bodies for quality and auditing. You can be confident that our course meets the highest standards of delivery. To find out more, or to enrol on to one of our courses, simply complete the ‘Contact Us’ box below or call us on 0191 6600 355. All 3 levels are mapped against the Competency framework. We will need an understanding of your job role,responsibilities,your experience,prior achievement and your aspirations especially if you are aiming for chartered status. Please get in touch using the contact form below and one of our dedicated staff will contact you to give you the information,advice and guidance that will help you with this. As the courses are distance learning therefore you can start at a time that best suits you. How long will the courses take me to complete? Each course has guided learning hours and we have designed each course based around these. There is more information in the individual course handbooks but you will also be guided by your personal tutor who will discuss this in more detail at induction. We deliver our courses through supported distance learning. When you enrol you will be allocated a Tutor (subject specialist in Quality Management) who will support and guide you during your qualification. Support can be provided on the telephone, by email and by skype/video calls. We also use a web-based e learning system which allows you to access learning and study support materials, past examination papers and much more. We want to make sure that you enrol on the right course at the right level, so that you have every chance of success. This is best achieved through a one-to-one discussion with you so we can fully understand your goals and previous learning experience, so we don’t currently offer on-line enrolment on our courses.